The weather is hot and party planning can be stressful, but the secret to a successful summertime fête is good wine. Whether you’re planning a barbecue, beach getaway, or an al fresco dinner party there’s really only one thing you need: Mionetto Prosecco Mini Bottles! Available in Rosé Extra Dry Sparkling and classic Prosecco Treviso Brut, this delightful drink can be paired with grilled foods, made into delicious cocktails, or served straight up – and it’s perfect for your summer festivities. While anytime is the right time to pop a bottle, here are are few of our fave places to enjoy Mionetto Prosecco Mini Bottles! Making cocktails poolside can be a slight struggle - trying to keep the pitchers full, cool, and free of chlorine water is a full time job! Instead use buckets of Mionetto Prosecco’s mini bottles on ice, ready to grab and go. You can serve the bottles with a matching straw for simple poolside sipping. Whether you’re grilling fresh fish drizzled with lemon or a spicy entrée, Mionetto Prosecco mini bottles are the perfect accompaniment. Set up a buffet of your delicious creations and don’t forget a tray lined with Mionetto’s mini bottles. Guests can pick them up and sip leisurely on the lawn without having to worry about glassware, so you can relax and enjoy your barbecue or picnic the way you intended. Before you buckle down to endure the crowds of a tailgate, make sure you stock up on Mionetto Prosecco mini bottles. After all, beer has become a horribly boring staple at tailgating events and everyone will welcome something refreshingly new like Prosecco. Pack the mini bottles in a cooler to make sure they’re kept at the deliciously, perfect chilled temperature and serve often. Give guests something adorably sleek that they’ll actually want to take home! 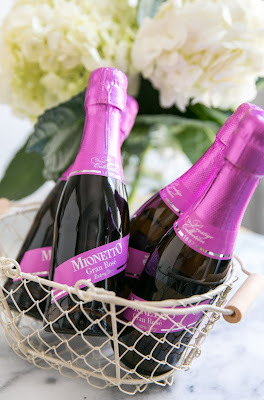 Mionetto Prosecco mini bottles are the perfect gift to give your guests, regardless of the occasion. Try printing personalized stickers and a matching thank you card to the neck of the bottle. Nothing says “thank you for enduring my bridal antics” like a chilled bottle of Prosecco.